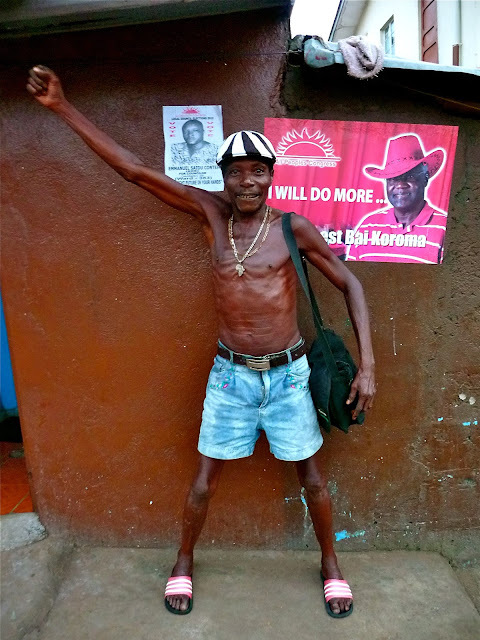 Sure, a pair of denim shorts worn sans a shirt with some gold bling and a black and white cap is always going to look great but this is certainly not the most remarkable outfit we've seen this election season in Sierra Leone. What makes this outfit special is that it was worn while history was being made. Moments before the photo was taken, it was confirmed by the National Election Commission of Sierra Leone that Ernie B had made it to his second term. Thanks Alusine Kamara for taking the time to strike your victory pose while the streets erupted into complete and utter mayhem around you. And big ups to Mama Salone for holding peaceful and fair elections.